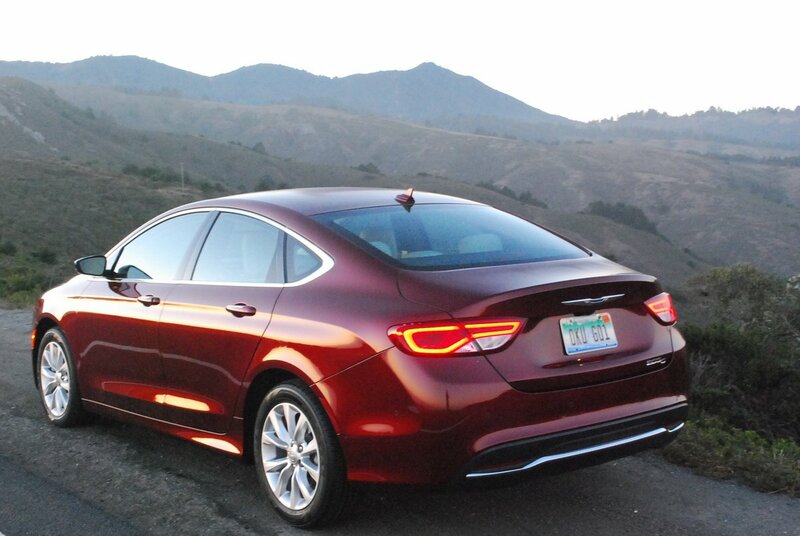 Earlier, we reviewed the all new Chrysler 200C, and observed that the V6 version equipped with optional 19 inch wheels and 235/40R19 tires made for a delectable and affordable sports sedan. This time, we tested the same basic car, but in place of the 295hp 3.5 liter V6, a 184hp 2.4 liter inline 4 occupies the engine compartment. 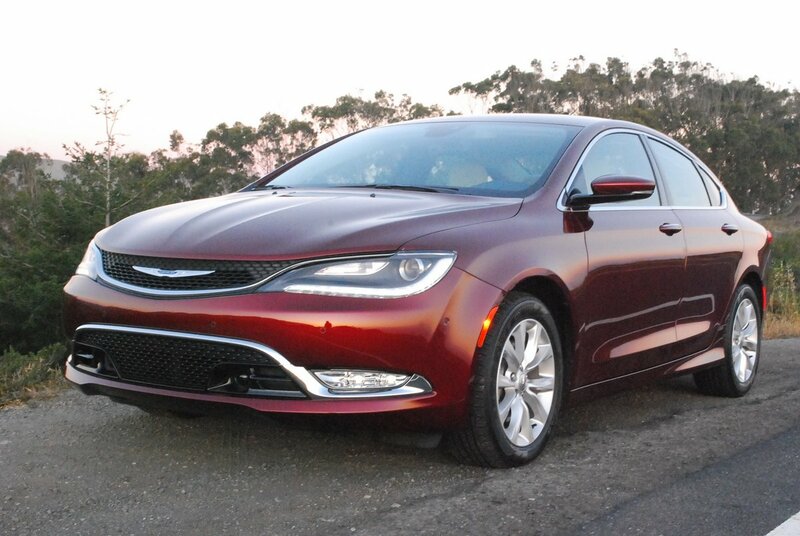 Like the V6, it too transmits power to the front wheels via Chrysler’s 9-speed automatic gearbox. Instead of the V6′ sticky Nexen 19 inch tires, the 4 cylinder 200C utilizes middling Goodyear Assurance radials (215/55R17) mounted on 17 inch alloy rims. The net loss of 111hp between the two versions changes the power-to-weight ratio of the 200C from a respectable 12.3 pounds per hp to a lethargic 19.8 pounds per hp. The loss of 20mm of contact patch at each corner reduces cornering adhesion significantly. 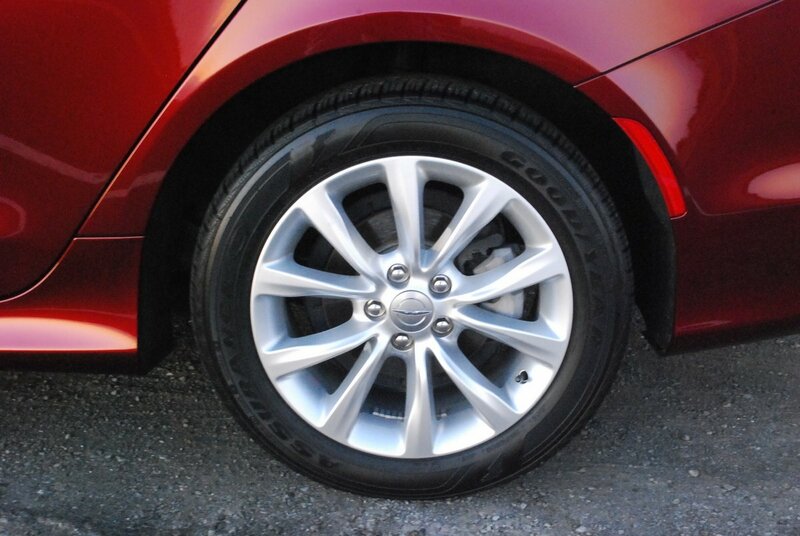 The switch from 40 Series radials on the V6 to 55 Series tires on the I-4 raises overall vehicle ride height. This higher center of gravity is a boon to ride comfort over rough road surfaces, but it erodes handling. Combined with the 4 cylinder’s soft springs and gentle shock absorber control, the four cylinder 200C porpoises in fast sweeping bends as the soft suspension bounces through its full range of travel. Most drivers will never notice the difference in the behavior of the two models of 200C because they will never press the car hard enough to assess such behavior patterns. For them, either version is more than adequate to the task of transporting 4 adults in comfort and style. But for those seeking BMW levels of driving enjoyment only the V6 version of this sedan will suffice. For those less consumed with the fine points of handling, the I4 200C provides a ton of luxury and design finesse for a reasonable base price of $26,225. One look around the interior will have you thinking base price must be $40,000. Chrysler engineers and designers have outdone themselves by producing a Ritz class interior for a log cabin price. If you order the optional “Premium Group” for $995, the leather cushioned and trimmed front seats include ventilation as well as heating. The center console and door panels receive matte finished wood trim panels that resemble re-purposed barn siding. The effect is both handsome and practical since the surface is non-glare. If you opt for the $1,395 “Navigation and Sound Group 1″ a huge 8.4 inch Touch Screen Display dominates the face of the dashboard, with clearly delineated prompts for access to all functions, including radio, apps, and climate control. Although you do need to bring up the climate program to activate the seat heaters and seat ventilation, you do not need to work through the Touch Screen for such basics as fan speed, or temperature settings. 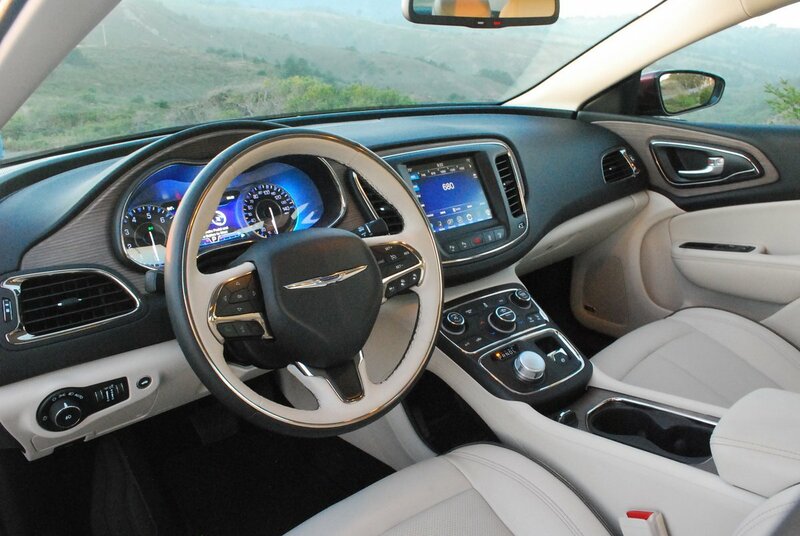 Chrysler has thoughtfully incorporated separate controls for these duties at the base of the center console. And they have also stolen a gambit from the Volvo playbook by providing pass through access and storage behind the base of that center console. In defense of the I4 200C, it must be pointed out that fuel mileage is exceptional for such a fully optioned, comparatively heavy (3,650lb.) sedan. Compared to its V6 sibling, which posts 19MPG in city driving and 32MPG on highway trips, the four banger makes 23MPG around town and 36MPG on the freeway, for an overall rating of 28MPG. Although you do trade significant performance for lighter fuel consumption, bargain hunters will tout the 4 cylinder 200C’s projected $1,500 savings in fuel costs over 5 years compared to the average new vehicle. Usually, vehicles we test have logged under 5,000 miles by the time they reach us. In the case of this Chrysler, however, the odometer turned 10,000 miles on our watch. In many ways, the accumulation of such comparatively high mileage leads to a more educated evaluation of a car’s strengths and weaknesses. In the case of this 200C, we noted that the 9 speed automatic transmission was rather jerky in its engagement on both upshifts and downshifts. But aside from that issue, the 200C was remarkably free of defects. In particular, the interior showed no visible signs of wear, while the exterior Red Pearl Coat paint looked as good as the day the car was delivered. The extended usage of this particular model bodes well for its long life prospects.